Chinese food is one of my favorite dishes. that's why I took it upon myself to learn how to do it myself, so that I can tailor it to my taste. I got the idea to do my own Chinese food the last time I was to a Chinese restaurant and thought to myself that I can do this. So, I created a shopping list with everything that I know is associated with Chinese food and I went grocery shopping. I wanted to add a healthier twist to the food that I love so much but made sure that it would still be tasty. In a large skillet, I heated the stove to medium Heat and added some sesame seed oil. After seasoning the chicken breast with salt and pepper I cut them up into strips and added them to the skillet. 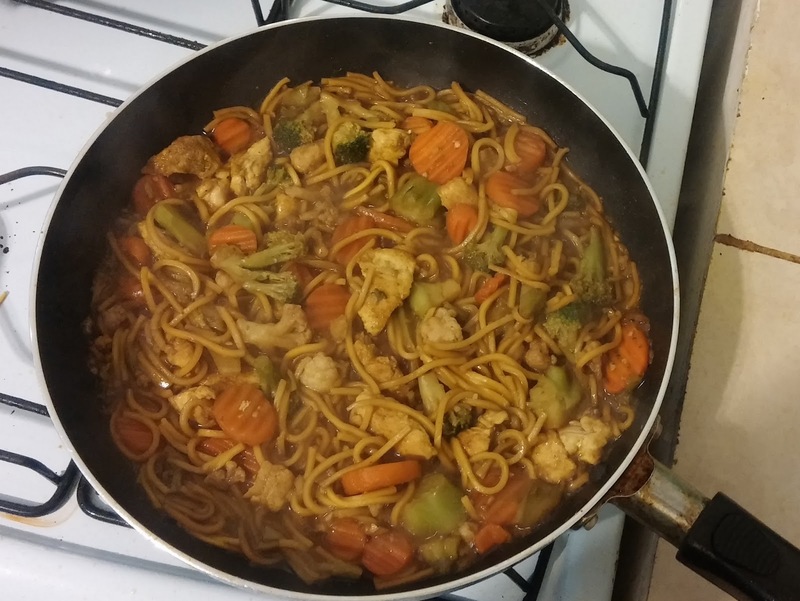 In a pan of boiling water, I added a little bit of salt then added me chow Mein noodles and let it cook on medium heat for 7 minutes. After the chicken, has been cooked I took it out and let it drain on a piece of paper towel then added more sesame seed oil. At this point I added my broccoli, cauliflower, carrots and celery pan sautéed 4 about 4 minutes. I slowly added chopped garlic to the dish. After the vegetables became softer re added the chicken. After the Chow Mein noodles, have been cooked also added that back to the skillet along with my low sodium soy sauce and then my scallions. I continue to stir for 1 minute until everything was cooked. This dish is absolutely delicious. It satisfies my craving for Chinese food without having to go to a restaurant to buy it. And this way I can add my own healthy twist to a meal that I love.